Building location, design and budget are a few important factors that can impact sustainability of a construction project. Our clients benefit from Manhattan’s comprehensive knowledge-base developed from our nationwide green building project experience. Our team members have the expertise to help identify opportunities to enhance the sustainability of your project, and find the optimum balance between your project’s budget and your green building goals. We have more than 9.6 million square feet of LEED®-certified or LEED-registered buildings underway or completed. 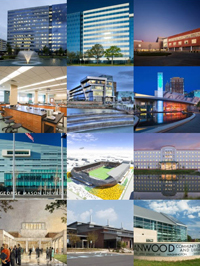 We have more than $3.3 billion in LEED®-certified or LEED-registered projects underway or completed. We are on the Engineering News-Record and Building Design+Construction magazine Top Green Builders list. Through our unique brand of Builder-Driven Preconstruction® service, our LEED® Professionals™ collaborate with you and project designers, engineers, and subcontractors to provide a solution-focused green building methodology to ensure harmony in sustainable design and construction. The LEED Professional Credentials (LEED AP® and LEED® Green Associate™) are owned by USGBC (U.S. Green Building Council) and administered by the Green Building Certification Institute (GBCI™). Manhattan Construction is a member of the U.S Green Building Council. Click here to view examples of Manhattan Construction Group's LEED-certified and LEED-registered building portfolio. LEED® (Leadership in Energy and Environmental Design) is a third-party certification program and the nationally accepted benchmark for the design, construction and operation of high-performance green buildings.